Financial markets can be a fickle friend and yesterday was no exception. After big falls on stock markets the day before, the door was open for a sustained sell off. Instead, it seems that the Dow Jones had fallen just enough to tempt buyers back into the market. The catalyst was a surprisingly robust US GDP report, which not only showed that the world’s biggest economy had returned to growth, but also that the pace of the recovery has been faster than forecast. Some of this growth can be attributed to government spending and inflation, but markets didn’t care. Investors went on a buying spree with one market fuelling another. As optimism flooded back into the markets, the yen was unceremoniously dumped as investors looked for better returns in more risky assets. 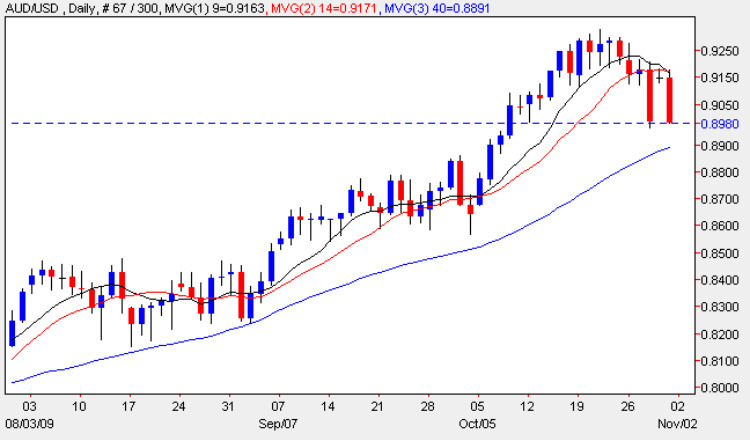 The day’s biggest movers were the AUD/JPY (Aussie dollar/Japanese yen) and the EUR/JPY (Euro against the yen). In early trading today those moves are unwinding slightly but it would take an exceptional day for all of yesterday’s gains to be eroded. It’s a busy day out there today with a number of potentially market moving events. However there are two top tier events with the first being the release of the latest UK house prices from the Nationwide. Analysts are expecting a slight dip compared to last month. Watch the GBP forex pairs for any reaction.The second economic announcement of note is Canadian GDP. Analysts are expecting slight increase on the previous month so keep your eye on the USD/ CAD for any reaction.